damage fences and other infrastructure. Given the impact pest animals have, it is important that everyone plays their part in reducing the risks they create. The introduction of the Biosecurity Act 2015 means that all tiers of government, industry and the people of NSW need to work together to protect the economy, environment and community from the negative impacts of pests, including pest animals. take effective action to manage local priority pests. 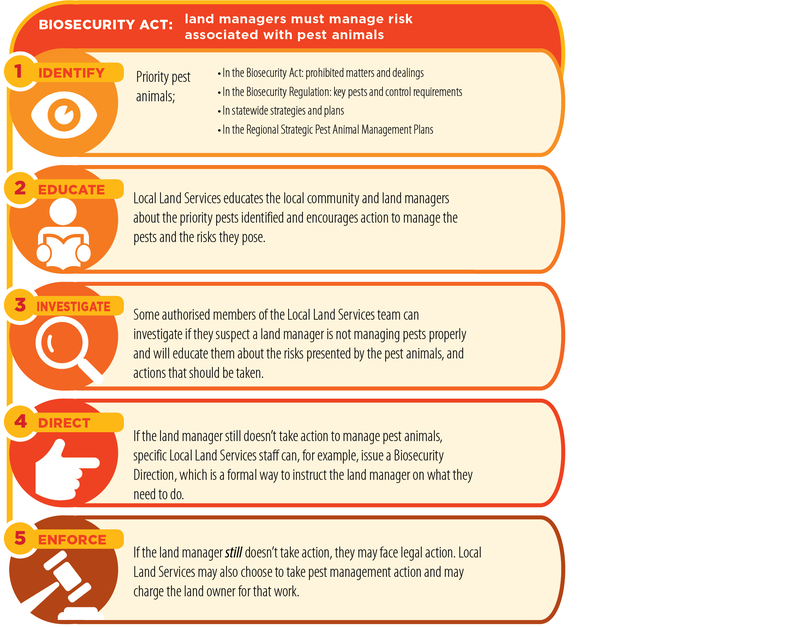 Land managers are supported in managing pest animals by NSW Department of Primary Industries, Local Land Services, and other public and private land managers, community members and peak industry bodies. A range of regulatory instruments, plans and strategies are available at a state and regional level to assist people to effectively manage pest animals. Land managers should also seek support and assistance from Local Land Services. Profiles for a number of animal pests that are important in NSW are available below. Each profile contains photographs, a distribution map, description, the status of the pest and links to related information. Read more about Pest animals in NSW.